I was kinda stuck, and couldn't continue to work without more materials but I wasn't sure which way to proceed. I figured the best way would be to just start on the fingerboard, so I went to the local hardwood store to purchase some ebony. 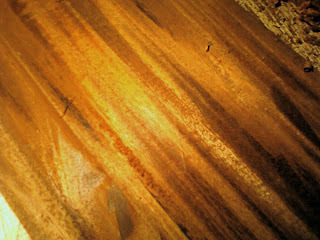 When I arrived I had to look at a rosewood board that I had been admiring online. It was a tad smaller (.25") than what I was hoping for but exactly what I wanted aesthetically. After looking it over I asked the yardman about ebony. He took me to a pile and I found this board and I loved it – dark, grain is pretty straight, and close to quarter-sawn. Asked him to cut out 21". 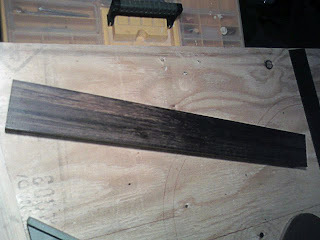 This board is wide enough and thick enough to actually do 4 fret-boards and cost $16. You can purchase these as blanks in luthiers catalogs, but I would have paid quite a bit more and would have only received one. Here is the same board ripped to a 3" width. 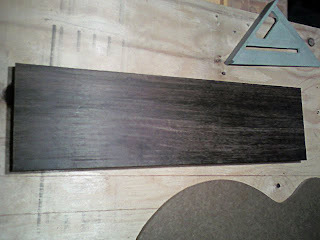 While the yardman was sawing out my ebony, I found this board (above) of mahogany. It was on sale and I asked how much for 36". He said it would be about $10-15 and I told him I would like that as well. 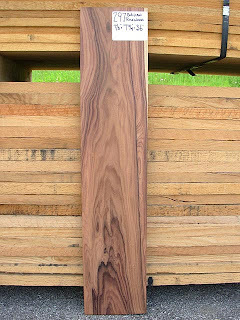 Maybe for a classical guitar in the future or even a different wood project who knows. Well, I purchased this board too. Now that's a lot to pay for one board for sure. But if I were to purchase sides and backs from a catalog I would be paying way more and I would only get enough wood for one guitar. This purchase allows for two guitar backs and sides plus the ebony. So I think I did well and others have agreed... Lisa may not.